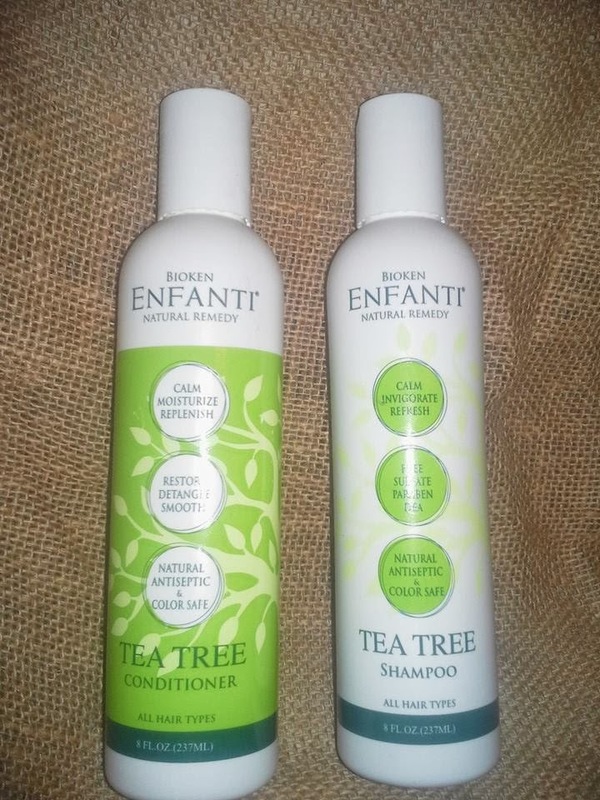 I was sent the Bioken Enfanti Tea Tree Shampoo and Conditioner to review. I was pleasantly surprised at the results. I am very careful what products I use on my hair. Yes, I color it! I have damaged hair with split ends. And, how I care for my hair after it is colored is key to keeping it healthy. I wash and condition my hair daily so i need a product that will do the trick on a daily basis. Not dry it out, not over moisturize but just the right balance to keep my hair healthy and vibrant. The Bioken Enfanti Tea Tree products were amazing to use. You can smell the minty scent as you massage your scalp. It is invigorating and I like the results. My seven year old son suffers from dry scalp during the winter months an I have been using this shampoo and conditioner on his hair. It has been a success, No more dry scalp and ugly flakes. Just clean, bright healthy hair for my son. If you have not tried Bioken Enfanti Tea Tree Shampoo and Conditioner, then I hope you will check out their website and social media sites. Your hair will love you for it. One lucky winner will receive the set of Bioken Enfanti Tea Tree Shampoo and Conditioner by entering via the Rafflecopter below. I have bad split ends and fly away hair. I have dry scalp really bad. Nothing really work to well. Also I have those flay away hairs. I have oily hair but I dont like to wash it everyday. My oil sometimes gets oily from too much washing! BB also suffers from dry scalp, hope this works with my silver lifelites. Gracias for the giveaway. My split ends are horrible! I would love to try this! Nice. I am always looking for better hair products. I have really dry hair that tends to get split ends, it's hard to find the right products to help. I have really thick hair that can get oily quick! This sounds awesome! I'd love to try it. I've always had problems with my hair splitting! i have problems with really dry hair. and i get split ends even though i don't use a lot of heat. my hair is past my hips and it's really hard to keep healthy. My hair had been all out of wack as of lately. Dryness, dull, spilt ends...should I continue?! Haha. Thanks for hosting the giveaway! My son and I have both been experiencing dry, flyaway hair. I think we need some conditioner! Thanks for hosting the giveaway! My hair has been dull limp hair. On top of shedding when brushing or washing it, its horrible. My hair get frizzy and it's worse in the summer when it's humid.